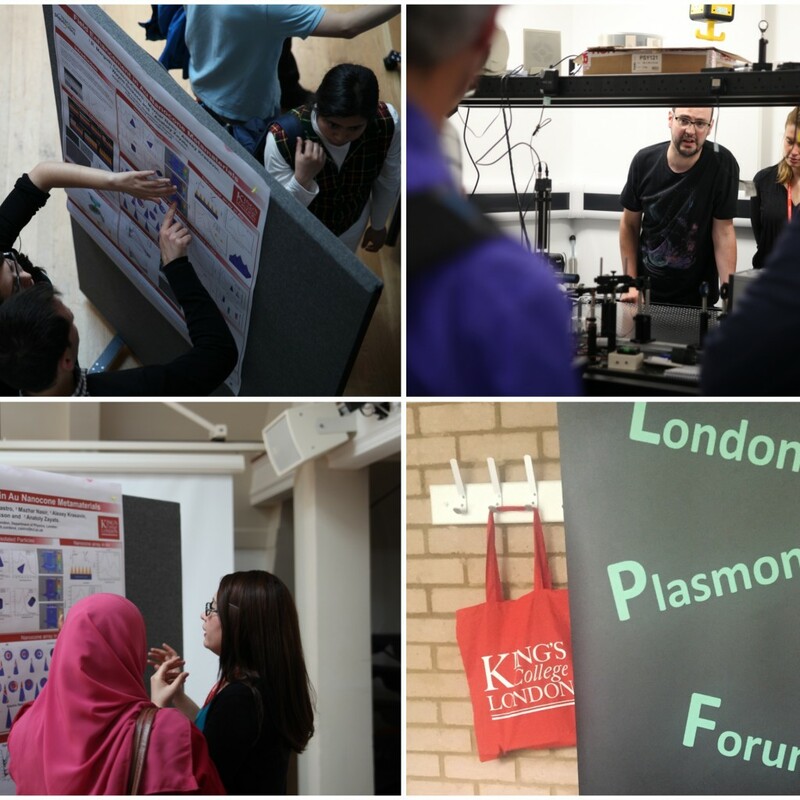 The 2nd London Plasmonics Forum was held on the 9th June at King’s College London. 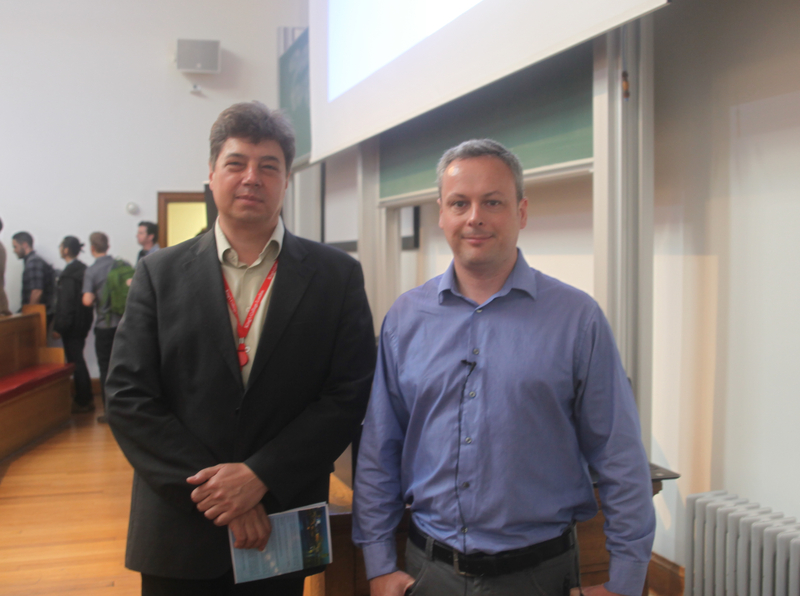 Dr Mark Gubbins from Seagate Technology gave a keynote talk on Data Storage Technology and Nanophotonics. With a growing demand for bigger data storage capacity, the hard disk drive (HDD) industry is constantly working on developing new solutions to increase the areal density of their devices. At the heart of the next generation of HDDs is a new technology called Heat Assisted Magnetic Recording (HAMR) which is pushing up disk drive areal densities beyond 1.5 Tb/in2. The principle of HAMR technology relies on the brief and local heating of the magnetic recording media with a laser in order to lower its coercivity and ease the writing process. Here, plasmonics plays an essential role as the key component of HAMR technology is a plasmonic near field transducer (NFT) based on a gold disk acting as a localized surface plasmon resonator and a smaller peg allowing the sub-wavelength localization of the laser light via the lightning rod effect. This type of NFT benefits from the presence of a large field enhancement used to deliver enough power to the magnetic media with only small incident laser power in order to reduce self-heating of the NFT as much as possible. As thermal effects are affecting the reliability and durability of the NFTs, research towards new low-loss plasmonic materials such as metallic alloys or transition-metal nitrides could open up new routes to the development of the HAMR technology. 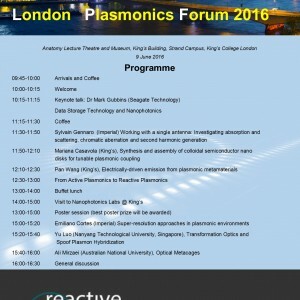 Dr Gubbin’s talk set the tone for the rest of this exciting London Plasmonics Forum by highlighting the importance and the potential of the research in plasmonics for cutting-edge technologies. 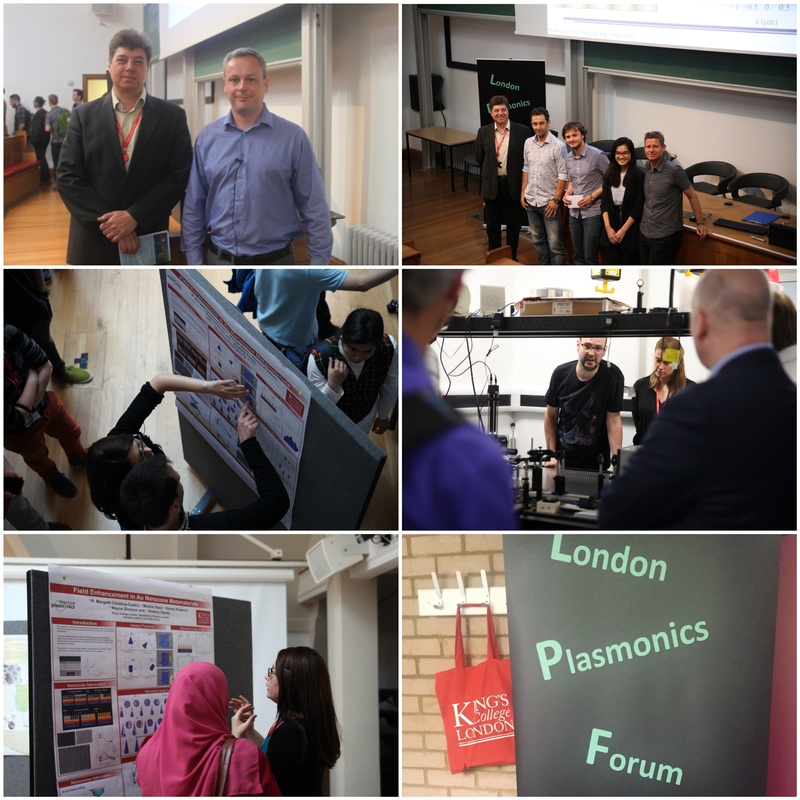 The forum was then followed by various talks given by PhD students and postdoctoral researchers about the latest developments in plasmonics. Sylvain Gennaro (Imperial College London) started the morning session with a talk in three parts on individual metallic nano-antennas and their role in the interaction of light with matter at optical frequencies. With the help of the spectral transmission phase of an antenna, he showed how to extract the contributions of absorption and scattering to the total extinction, and clarify the mechanism of Fano interference in a multi-particle dimer antenna. Then, he developed a systematic approach to retrieve the longitudinal chromatic focal shift of our high NA microscope objectives using optical antennas and finally studied a range of multi-resonant antenna configurations to expose the interplay of symmetry and scattering phase in second harmonic generation. 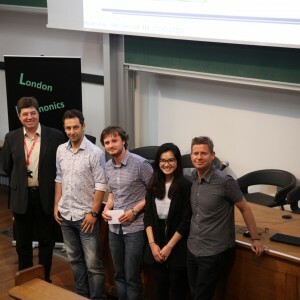 Marianna Casavola (King’s College London) presented her work on the synthesis of semiconductor plasmonic CuS nanocrystals showing a tunable surface plasmon resonance in the near infrared and the importance of the surface ligands in the inter-particle interactions and plasmon coupling. Pan Wang (King’s College London) then talked about electrical stimulation of plasmonic excitation and related light emission in Au nanorod metamaterials, based on both air-gap tunnel junctions and polymer-monolayer tunnel junctions. The electrically driven plasmonic nanorods metamaterials provide a fertile platform merging electronics and photonics for studying and manipulating electron and plasmon at nanoscale, and open up opportunities for developing tunneling-based miniaturized devices such as light sources, modulators, sensors, and photodetectors. During lunch there was a poster session with approximately 35 posters. 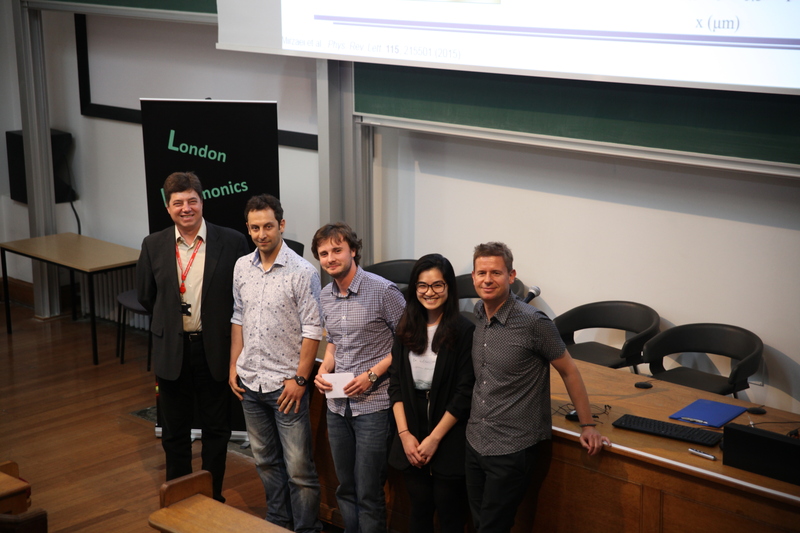 The competition was won by Benjamin Vest from Laboratoire Charles Fabry – Institut d’Optique with a poster entitled ‘Experiments in quantum plasmonics’. Also during the lunch session there was an opportunity to have a tour around the nanophotonics labs which were opened in September. In the final session of the forum Emiliano Cortés (Imperial College London) gave a talk on plasmon-induced surface chemistry and the recent interests in plasmonic losses and their large range of applications by extracting hot-carriers generated after the plasmon decays. In his talk, he showed experimental results on the hot-electrons transfer from plasmonic antennas to molecular systems and the localisation of these events with a 15 nm resolution. These results allowed to map the reactivity in plasmonic antennas highlighting the geometry-dependent behaviour to extract the carriers and also allowing selective surface-chemistry modification in the nanoscale. Yu Luo (Nanyang Technological University, Singapore), in his talk entitled Transformation Optics, Electron Energy Loss and Effect of Nonlocality, focused on a new method based on transformation optics to analyze the electromagnetic response of plasmonic particles under electron beam excitation. 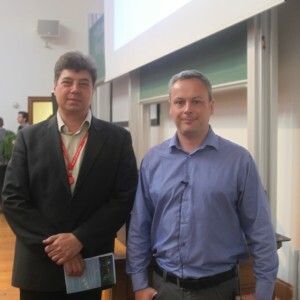 He showed detailed analytical results for the electron energy loss and photon scattering spectra of 3D dimer (representing the prototype of interacting plasmonic systems), as well as their time-domain response. The last talk of the day was given by Ali Mirzaei (Australian National University), who presented his work on optical metacages. Metacages are novel structures for spectrally selective optical shielding of arbitrary shaped volumes by arranging specifically designed nanowires around an area that needs to be protected. A semi-analytical approach following by numerical simulations verification were employed to analyse several designs of such optical metacages made from either metallic or dielectric materials. 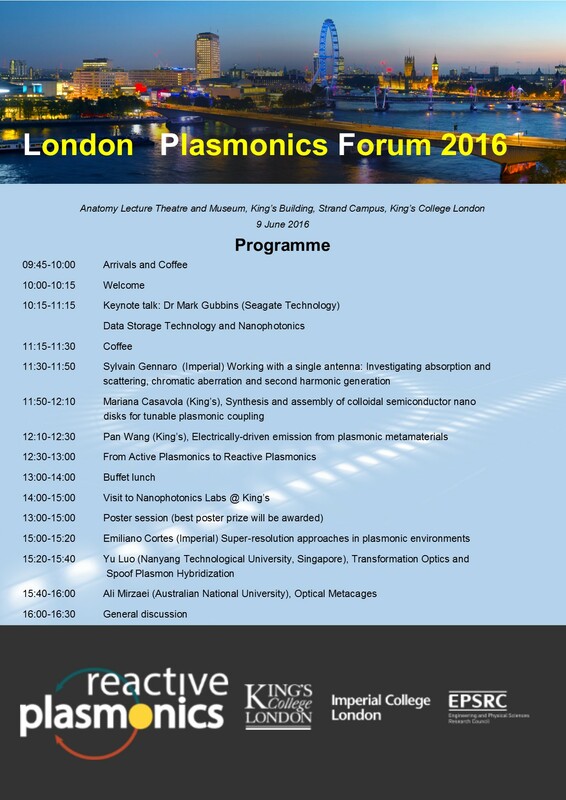 Planning is already underway for the Third Plasmonics Forum in June 2017. We look forward to hosting it.